For the true Billy Idol fan who has seen him perform before, the acoustic Billy Idol/Steve Stevens duo was a dream performance on Saturday, March 30 at the sold out 1,500 seat Excite Center of Parx Casino in Bensalem, PA. I’m the type of fan who really likes to know the individual person in addition to their music. I used to love VH1’s “Behind the Music.” But this performance was much more intimate than any scandal you are going to hear from the VH1 announcer. 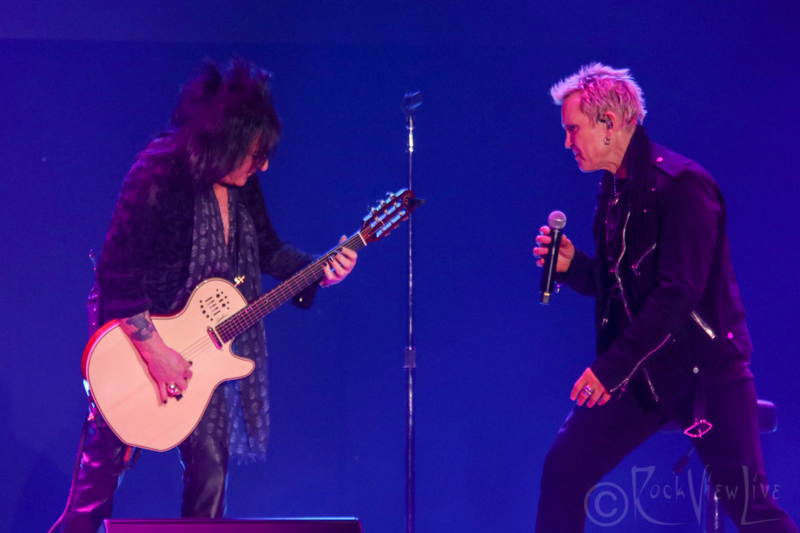 Idol and longtime guitarist, Steve Stevens opened the two-hour show with “Dancing with Myself.” The song was first recorded by Idol with his original band, Generation X in 1980 for the album Kiss Me Deadly. Most people know it from his 1981 solo EP, Don’t Stop as well as its inclusion on the re-released version of his 1982 self-titled debut album. Throughout the show, Idol stopped and shared memories about the songs and what was going on in his world when he recorded each song. He mentioned falling in love with Rock music when he was only six years old and discussed the types of music that were around in the early ’60s in his native England. He even commented on the recession in England in the ’70s saying, “If you think it was bad in America then, it was much worse in England.” He revealed that he played in a ’60s cover band when he attended “university.” He went on to play “Twenty Flight Rock,” a song from 1964 by Eddie Cochran. At 63 years old, he still has his voice and can hold his notes! He discussed how he first found punk music in the late ’70s and how the police would be incredibly violent against punks back then; it was risky just to go out at night. This led into Generations X’s “Kiss Me Deadly.” He also discussed a UK TV show, Ready Steady Go. I was anticipating that he would play Gen X’s song by the same title, but I was out of luck there. Idol continues with stories about his move to New York City in 1981 and his surprising love of the original Star Trek. At this point he was only six songs into his 13-song set. He went into a moving monologue about his father, a World War II veteran and how he thought he would live to be 100. At age 84 he was still out golfing. As his father got older and suffered from several medical issues that culminated into lung cancer, he spent considerable time with his family back in England. He said that his mother told him that his father passed away listening to his song, “Ghost in My Guitar” from 2014’s Kings and Queens of the Underground which he then performed. I was personally mesmerized by his honestly that stripped away his rugged image. However, after about 25 minutes some of the crowd who was there to hear music, not an autobiography, appeared restless. The music picked up and we were entertained as Idol “interviewed” a very native New Yorker, Steve Stevens whose dark mane of hair has complimented Idol’s blonde spikes for much of the past 36 years. Steven’s guitar skills were showcased in their acoustic setting with their “$175 drum machine” that they bought for a 300-person show in Los Angeles last year. That was followed by “Eyes Without a Face” that lead into a solo for Stevens and a brief break for Idol. Idol appeared to be in great shape, so he deserved a break after all that talking. “Don’t Need a Gun” and “To Be a Lover” lead to talk about how the song “Rebel Yell” came about. He was at a party in New York City at Ron Wood’s house and Wood, Keith Richards and Mick Jagger we all drinking a brown liquor later identified as Rebel Yell. He couldn’t resist the title of The American Bourbon Whiskey, and joked that he asked the Stones if they considered using that as a song title and the rest became his second album. “Rebel Yell” brought fans finally on their feet. The encore of “White Wedding” made it worth the wait, though I’m not sure why he picked a cover of “Shakin’ All Over” by Johnny Kidd and the Pirates for his final song. I know that I never heard it before. If he was going to end on a cover, why not his well-loved “Mony Mony” that he made famous? All in all, for Billy Idol fans it was a rewarding glimpse into the process that happens in his silver-spiked head.